Then let me ask you this ...do you suffer from such things as auto-immune disorder, blood sugar imbalance, Crohns Disease, digestive problems, chronic fatigue syndrome, diverticulitis, diverticulosis, Epstein Barr, hiatal hernia, irritable bowel syndrome, spastic colon, ulcers and ulcerative colitis, just to name a few? It's time you take responsibility for your own health. You can begin to enhance your immune system with Healthy Systems Aloe Pure 5000 drink. The Aloe Vera Plant is an herb resembling the cactus in appearance, but it is actually a perennial succulent belonging to the lily family. It's botanical name is Aloe barbadensis. The word Aloe Vera, Vera is the Latin word which stands for true. 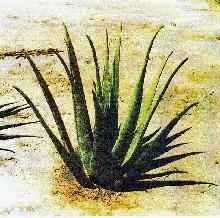 It was named in ancient times because this species of Aloe was thought to have the best medicinal properties. Aloe Gel has been used to treat inflammation for more than 2000 years. The gel is the most ingenious mixture of antibiotic, astringent, coagulating agents, while also being a natural pain and scar inhibitor and a growth stimular, stimulating new cell growth threefold. Used as a drink internally, Aloe Vera will aid digestion and reduce the effects of arthritis, stomach ulcers, diabetes and a variety of other serious conditions. During the past hundred years, significant scientific understanding of the science of Aloe Vera has evolved. Researchers throughout the world have revealed more and more of the biological mechanisms for the activity of Aloe Vera, and new clinical indications for it's use in the treatment for human disease and regulating metabolism. Help Support Your Healthy Immune System! Aloe Vera for overall health, helps support your own healthy immune system, as well as many other natural body functions with an average daily consumption of two to eight ounces. By all accounts, including several of our own, two to four ounces of 100% stabilized Aloe Vera, taken twice daily, are able to offer a maximum of relief to arthritis suffers. Usually it takes two to three weeks for this to come to fruition, but the positive effects are consistent and apparently wide spread. Often users report a decrease in stiffness and soreness, especially in early morning, as well as an increase in flexibility and strength in their joints. Interestingly, when one stops drinking the Aloe Vera, it takes about three weeks for the benefits of the Aloe Vera to disappear. Testing the use of whole leaf Aloe compared to the use of individual molecules from the plant has shown that the whole leaf Aloe Vera is up to six times more effective than the individual Aloe Vera components alone. This highlights the importance of a couple of things. First, a major problem: There are a good many commercial Aloe Vera Drinks on the market that are either mislabeled, misbranded, or misformulated. Some contain an excessive amount of unregulated laxative contaminants bitter to the taste, and are then diluted with water to make them more palatable. Though the product may be labeled as containing 99% Aloe Vera, analysis often reveals contents of 65% to 85% water. This is not only misleading, but in direct violation of FDA regulation. So, "caveat emptor" (let the buyer beware), is certainly a criteria which applies here. The important issue is to know your supplier. Find a respectable company with an impeccable reputation and a loyal customer following. Continued usage of a product is a good indication of a satisfied customer.